Music by Jerry Bock, Lyrics by Sheldon Harnick. Book by Joseph Stein. Therry Dramatic Society. Arts Theatre, Adelaide. June 8 – 17, 2017. 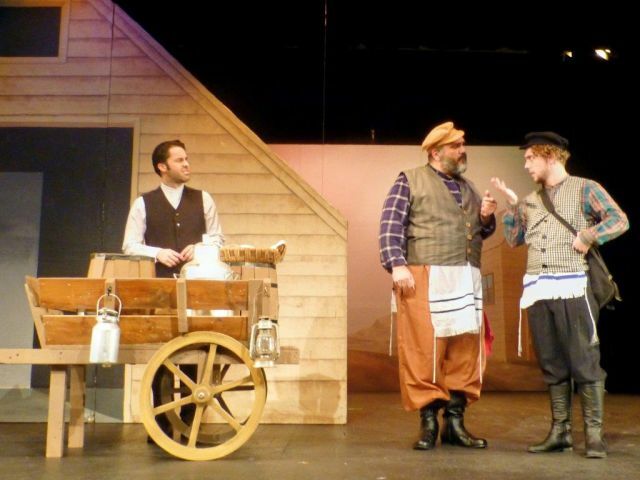 Fiddler on the Roof has been a show close to my heart since I played in the orchestra for a production in 1981. Naturally I went to Therry’s production with high expectations and I was not disappointed. The story is simple but full of pathos. In the little village of Anatevka, Tevye, a poor dairyman, tries to instruct his five daughters in the traditions of life in a small Jewish community, in the face of changing social values and the growing anti-Semitism of Czarist Russia. Torn between tradition, religion and love for his daughters he must make some life changing decisions to keep his family together. Therry’s production captures the bleakness of early twentieth century Russia in every department – lighting, costumes and set design. More than that though, thanks to director Norm Caddick, every laugh and tear is skilfully highlighted. The success of Fiddler on the Roof depends of the character of Tevye; if this character does not break the fourth wall of theatre and relate to the audience the piece will fail. David Gauci (well known performer and director of his own theatre company) does more than inhabit Tevye’s character, he lives it. Gauci’s rich baritone voice and perfect timing quickly endear him to the audience and his conversations with God and quotes from the good book are hysterically funny. Conversely, the scenes where he is torn between the love for his daughters and his religion are heart rending. He is well partnered by Anne Doherty as Golde, his wife. She is the perfect foil to Tevye’s brashness. Her performance in the dream scene and her duet with Tevye, ‘Do You Love Me?’, demonstrate her ability to handle a wide range of emotions. Georgia Broomhall (Tzeital) and Eloise Quinn-Valentine (Chava) give satisfying performances and their performance of ‘Matchmaker’ is a highlight. However Ruby Pinkerton (Hodel) steals the audience’s heart, particularly in her solo ‘Far From The Home I Love’. I could really feel the stillness and sympathy for her character from the audience. Jared Frost gives one of his best performances as Motel the tailor. His crystal-clear tenor voice and vulnerability make ‘Miracle of Miracles’ a highlight. There are many other notable performances that make Therry’s Fiddler on the Roof a real ensemble show. Nathan Quadrio as Perchik, a radical Jewish teacher from outside the village, starts slowly (maybe opening night nerves) but quickly develops in act 2 when Perchik’s marriage is put to the test. ‘Now I Have Everything’ is a difficult song to sing successfully and Quadrio handles it well. Robin Schmelzkopf (a favourite with Adelaide audiences) nails the character of Lazar Wolf. One really feels for the character as he suffers the indignity of the cancellation of his marriage agreement. 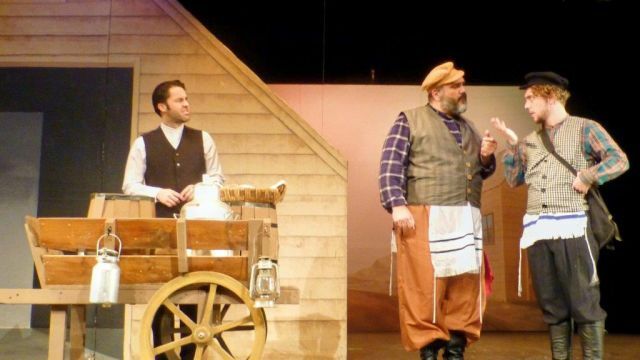 Having played Tevye in a previous production, Schmelzkopf really understands this show. Although some of the Russian accents varied on the night, Sam Burt (Fyedka) delivers the most convincing accent I have heard for a long while. I have seen five productions of Fiddler on the Roof and thanks to Sandy Wandel (Fruma-Sarah) I understood every word of ‘The Dream’. This song is extremely rapid and important to the plot so it is essential that every word is clear. Mitchell Smith is a lesson to us all that you don’t have to play a large role to make an impact. His solo in ‘To Life’ with its soaring top notes earnt well deserved applause. The orchestra, although competent, did have a few disappointing moments, mainly when synchronising with the entry of singers. This may have been opening night nerves or the fault of some of the singers, but should resolve as the production settles in. Overall, they handled a difficult score well. All in all, though written in 1964, Fiddler on the Roof deals with family values that are still very relevant today and is an entertaining night out in theatre.